In keeping with current technology, George decided to incorporate Microcurrent therapy into his practice. Being skeptical by nature, he made that decision after participation in several workshops using the technology. The results were more dramatic than he could have imagined! Even tough scar tissue released with the Avazzia device. When scar tissue exists it pulls on the fascia and effects areas remote from the scar. Ultimately it can change alignment of the body. Uses extremely low-level electrical currents (microcurrents) to treat nerve and muscle pain inflammation and other health challenges. Each tissue has its own specific electrical frequency which may be interrupted by injury or disease. 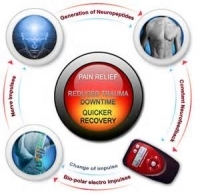 Microcurrent threapy simply restores normal frquencies within the cells, resulting in remarkable improvements in pain, inflammation and function.